Simon Kemp spotting the provocative image of the football top on the JD Sports website. 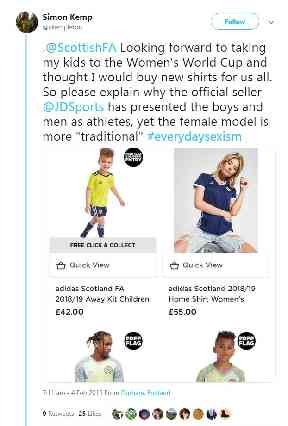 A sports retailer has removed a provocative picture of a woman wearing a Scotland strip after a father complained on social media. The image on the JD Sports website showed a woman in jeans with rips on the thighs sitting with her legs apart while photos advertising male kits displayed men and boys in athletic wear. Simon Kemp spotted the discrepancy while preparing to buy kits for his children and raised the issue with the Scottish Football Association (SFA) and JD Sports, the official Scotland strip retailer. The SFA asked JD Sports to remove the image which it did and both apologised for causing any upset. 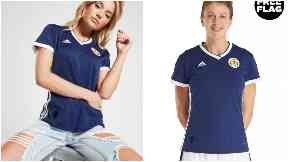 Mr Kemp took to social media to highlight the issue, tweeting: "@ScottishFA Looking forward to taking my kids to the Women's World Cup and thought I would buy new shirts for us all. 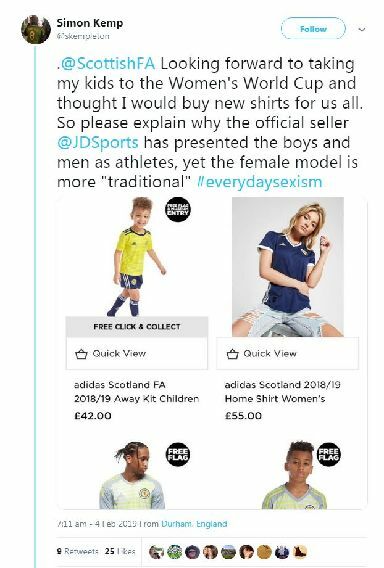 "So please explain why the official seller @JDSports has presented the boys and men as athletes, yet the female model is more "traditional" #everydaysexism." He added: "@ScottishFA And by the way, my daughter plays football too, as do thousands of girls. What kind of example does this set for them? @JDSports"
After the images were changed he tweeted: "I'd like to think we made the world a slightly better place this morning." JD Sports have replaced the image with a conventional sportswear style picture of a woman wearing the kit. An SFA spokesman said: "We apologise for any offence that this image caused. As soon as this was brought to our attention we contacted JD Sports to request its removal, which JD Sports immediately acted upon. "At the Scottish FA, we are absolutely committed to further strengthening equality and diversity in Scottish football and promoting the girls' and women's game across the nation." JD Sports apologised for any upset caused. A spokesman said: "We occasionally test alternative product styles online to appeal to the full range of customers who visit our site, from those interested in high fashion and and leisure, to sportspeople and football fans looking for kits and training equipment." "While the principle images used for this product online were modelled in the traditional sportswear style, an alternative fashion-led image was tested for a short time. Following comments from one customer and discussions with the Scottish FA, this image has been removed. "The product is now only displayed on our sales channels in the traditional style, and our photography guidelines have been reviewed to ensure this doesn't happen again. "We remain committed to promoting and supporting the Scotland Women's teams in the build-up to the FIFA Women's World Cup this summer, and apologise for any upset this has caused."